An autoresponder replies automatically when a specific email address receives an email. This is great to use when notifying customers you have received their email and they will get a response in a pre-determined time frame. It is also helpful when you are out of the office (such as on vacation), since you can easily let people who contact you know you are currently away and will respond to their request when you return. 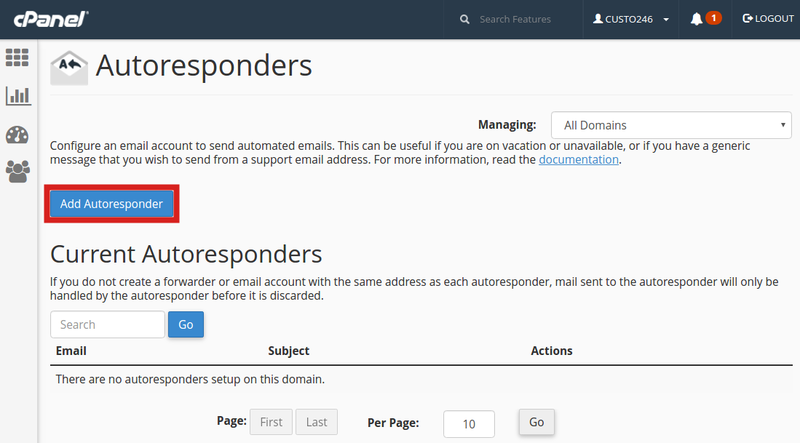 In this tutorial we will show you how to setup an Autoresponder in cPanel. You can also setup an auto-responder in Webmail. Click the Autoresponders button in the Mail section. Character Set The standard Character set is "utf-8," but you can change it here. Interval Here you can set how many hours to wait before autoresponding to the same email address. Email This will list the email address you are setting up the autoresponder for. From You can enter a "From" address here. I recommend using the same address a the Email field. Subject Enter a subject line here. For example: "John is out of the office." HTML Check this if you want to enter HTML into the "Body" of your email. Body Enter your Autoresponder message here. Start Choose if want this autoresponder to begin Immediately or set a Custom start time. You are finished when you see a message stating "You have successfully created... auto responder." Congratulations, now you know how to setup an Email Autoresponder in your cPanel. We also have a full Education Channel that includes Everything Email. We are changing someone's email address. Should we set up and auto responder with that message that has the new email then create a forwarding to her new email? I am over thinking this I believe but she has some emails she wants to make certain she doesn't miss. Or would it be best to keep both emails active for a while and let her contact people individually until her old email slowly gets none. Both would work (forwarder or using both until all senders are transferred over), it depends on what your client would prefer. Unfortunately, this is not a feature available in the Auto-Responder cPanel tool. I recommend you use BoxTrapper. This is unusual behavior. The email should be delivered as usual. I recommend removing the auto-responder and try setting it up again. You can also test sending/receiving while that auto-responder is removed to ensure no other issues are lurking. It seems like there may be an email filter setup as well, which may be discarding the email rather than deliverying it and responding to it as the auto-responder should. We receive a considerable amount of spam emails into one of our addresses, and no matter how much we block them, it doesn't stop. Currently the emails we send to clients are exactly like autoresponders telling them of a change to our address and website and to email a different address and to visit our new website - about 75% of clients say they find our replies in their spam folders. We've brought this up to IMH on numerous occassions with no permanent solution in sight. If I set up an autoresponder, and it replies to clients including the spam, will our email account get flagged for suspicious behaviour or will the address get blocked / blacklisted? What, if any, is the negative impact of having an autoresponder sending the same message over and over? Will all of the replies go to inboxes or will we end up going into spam again? Does having an autoresponder help deliverability or will it be the same result? As long as you have SPF records/Domain keys setup, and a DMARC standard set you have done everything you can do to verify you are the valid sender of emails for your domain, and they have not been modified. Once the InMotion email server has delivered the email top the recipient it is no longer in our control. From there it is up to the recipient's spam rules and filters to determine where the emails go. Autoresponders should not cause any problems for your clients since it is just responding to an email they sent you. Most intelligent email filters will whitelist addresses you sent to since it is common for people to respond. Replying to a spam address would only email the address of the spammer so it should not cause you to get flagged. The cPanel Auto-Responder "from" address will always be the email address that the auto-response is configured for. If I wish to send an autoresponder 3 rd party like mailchimp do i have to configure anything in cpanel ? We're not sure what you mean by "send an autoresponder 3rd party." MailChimp has its own mail system, so if you send anything from there at all, it is not using our mail servers. Mail with an autoresponder The autoresponder setup in our mail servers is for email being processed by our email servers. If you require further assistance, then provide more information about how you're using Mail Chimp with our servers and we can look into the issue in more depth. I have clients who need to setup or initiate their autoresponder to new dates. Is there a way to do this without them going through the CPanel? cPanel provides some documentation on performing command line maintenance, but this requires shell access, and these commands can do damage if not used cautiously. Using cPanel would be the safest way to achieve what you need. 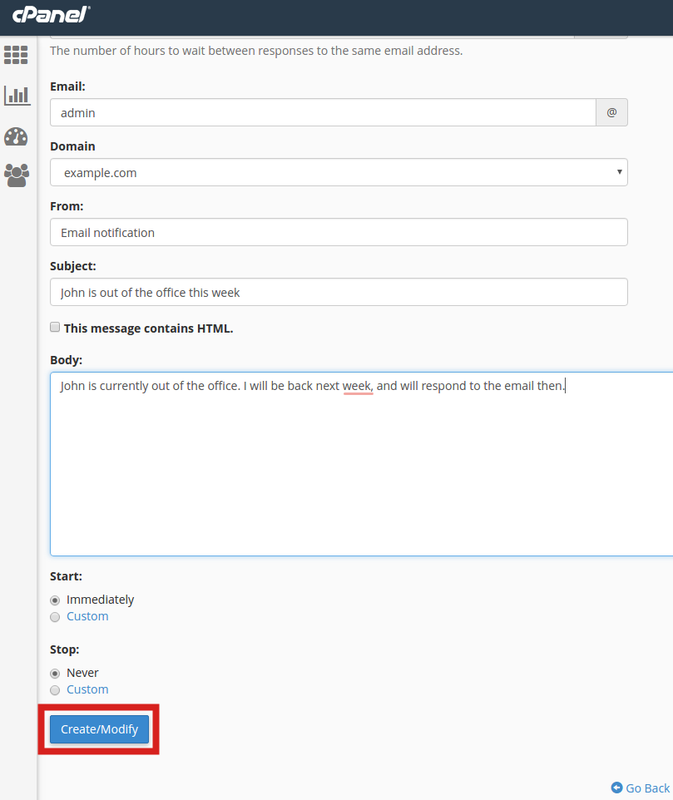 How can we prevent Auto response to send for a specific emails ? Autoresponders don't work that way. It really is all or nothing. Autoresponders will respond to everyone or not at all. I have tried to create an autoresponder using the guidelines above. However, when I click "create/modify" the page bumps me back up to the field where I am supposed to enter the pre-@ part of my email address. There is no error message explaining what is wrong and I have verified that the address in question does exist. *Note: The above behavior occurs in firefox. When I attempt the same action in Chrome, clicking on the "Create/Modify" button produces no result whatsoever. Are there any known problems that would result in this behavior? Since this does not seem like typical behavior, I recommend contacting Live Support so they can replicate the problem within your specific account.